In case you’ve been dreaming of going to Rome all your life, we’ve got great news for you–that’s where Sylvester is taking us today! Roman culture is perhaps the best known and wealthiest in available knowledge among ancient cultures. Art, however, is harder to classify. Much of the Roman art we know is either heavily influenced by or a direct copy from Greek art, which makes it difficult to say what is authentically Roman. (Sylvester sniffed annoyedly at this, saying he never could have gotten away with that much renown for plagiarism.) But actually, even the art which was a direct copy was still skillfully crafted by the hands of Roman artists. Imagine how proud you’d be if you went into an art museum to practice and came out with something that looked just as good as a Michelangelo! 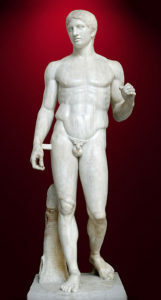 Roman art includes all kinds of media, from architecture to sculpture to painting! You have probably already noticed that today, we’re going to talk about sculpture–specifically this one of Augustus of Primaporta. In ancient Rome, just as today, politicians relied somewhat on imagery to present their persona to the public. Since TV’s and magazines weren’t widely available in the first century AD, that presentation was accomplished through statues. 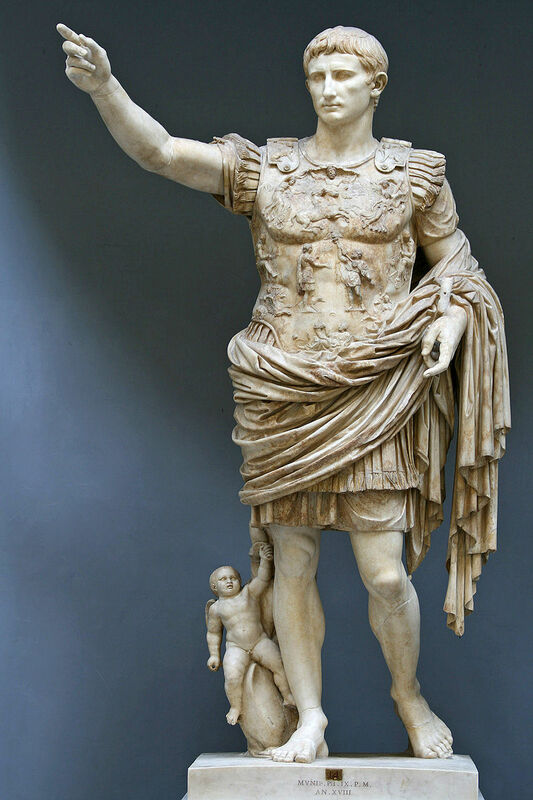 Emperor Augustus was represented in several works of art, and as you can see here, he was idealized as a figure of great power and influence. He’s depicted as a military victor. He’s the image of perfection. If people believe this image, they’ll fear and respect him. And no matter his age (he lived to his seventies), he was always depicted as am ageless youth. But Augustus’ claim to perfection is depicted in ways much more significant than simply his *ahem* highly attractive body type. For instance, the cupid figure at his feet, riding a dolphin, was descended from the goddess Venus in Roman mythology. Augustus’ adoptive father, Julius Caesar, also claimed to be her descendant, so I’m sure you’ve noticed what’s going on. 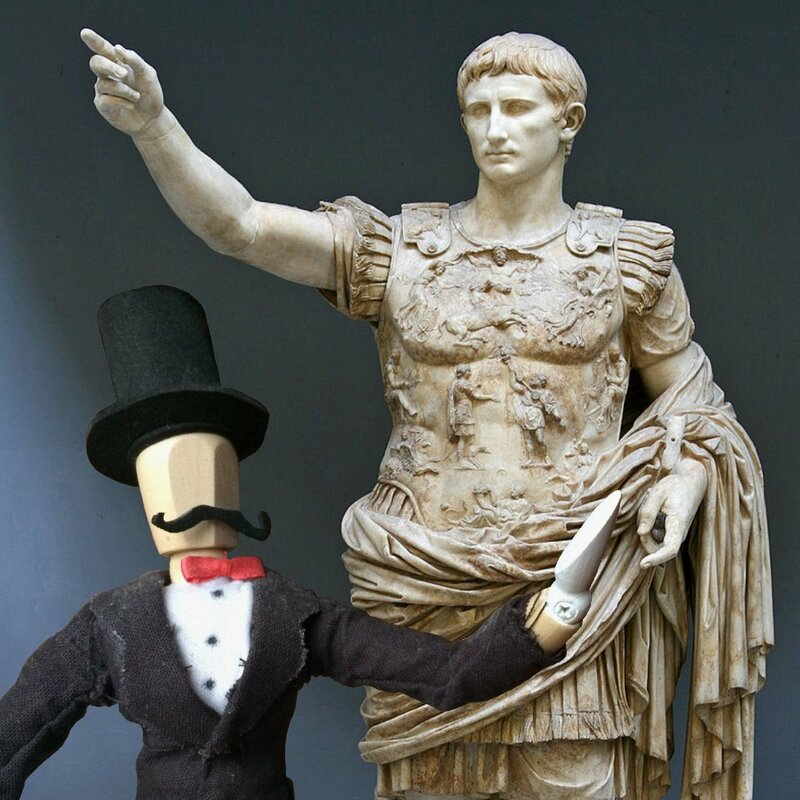 Augustus is claiming a deity connection. (The dolphin was his long-time symbol of his defeat of Mark Antony and Cleopatra, giving him complete power of the Roman Empire.) His breastplate, too, is adorned with images reinforcing his image as being backed by the gods. 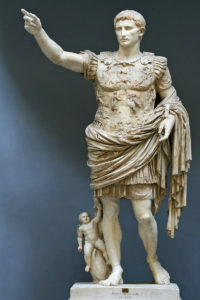 There is speculation that Augustus intentionally requested this, suggesting that he is the rightful successor and conqueror of power over Greece. Primaporta is the Italian town where the sculpture was found, hence the name. It’s believed to be from about 20 AD. Enjoying all this information about Roman Art. It is very intereating!